Celebrate 10 years of body art with us! 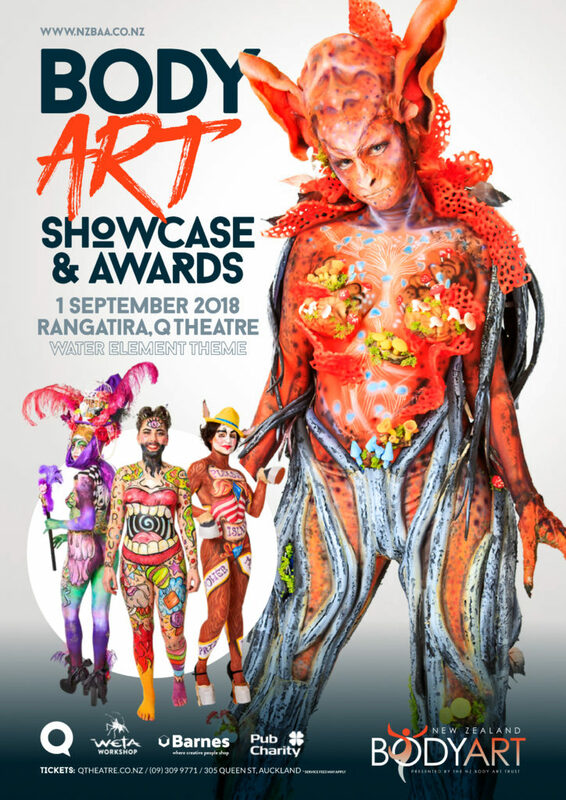 The Body Art Showcase 2018 to be held at Rangatira, Q Theatre on Saturday 1st September 2018 will be themed on ‘THE WATER ELEMENT’. Water is the element that is constantly moving, slow and steady and swirling inside each of us. It is the element of conception and death, of illusions and fairytales and holds the secret to our soul. It’s the beginning and it’s the end. Water is a vital resource for our existence, a source of food, transport and power and the creator of incredible structures; water will paint the world with beauty then return to its fold and rejoice. Water will move mountains particle by particle with a subtle change. Humans pollute our life source but in return water can be a destroyer of our life source. The Body Art Showcase 2018 will focus on ‘Water – The Element’ through themed sections that illustrate how this element is used and abused by mankind. It will illustrate the beauty of water through its creations and life support but will also illustrate how water can destroy and be destroyed. As with the 2017 Body Art Showcase, this year’s Showcase will feature six themed sections. The artist may use any paint technique or prosthetic style as long as it keeps with the theme of the entered section. There are two exceptions: the opening themed section ‘Water’ is an open category allowing the artist to interpret their own meaning of water. This section is non-competitive meaning it will not be judged. The ‘Submerged’ section is based on UV allowing the artist to use any paint and prosthetic technique providing the art work will display under UV light. Now in it’s 10th Year, this must see event, will not disappoint. Join us for an evening that celebrates creativity with artists not only from New Zealand, but from all around the world.